Breast imaging is a technology that is widely used to obtain a high resolution visualization of breast and related diseases. Breast cancer is the most common cancer found in women. Breast imaging techniques play a major role in early diagnosis of the disease by evaluating the advancement of the disease and deciding which treatment is suitable. This breast imaging technique enables doctors to observe the efficacy of treatment and how patients would respond to it. The current practice of screening is based on mammography, ultrasound, MRI, nuclear imaging and thermography. Breast cancer is stated as one of the leading cause of cancer-related deaths among women. The incidence of breast cancer has considerably increased since the last decade, which in turn has increased the mortality rate among women due to cancer. Women aged above 40 years or those who are going through hormone replacement therapy are at higher risk of developing breast cancer. In addition, the expanding number of aging women worldwide has aided the rise in breast cancer cases. Such factors have led the breast cancer imaging market to surge exponentially. This report identifies the global Breast Imaging Market size in for the year 2014-2016, and forecast of the same for year 2021. 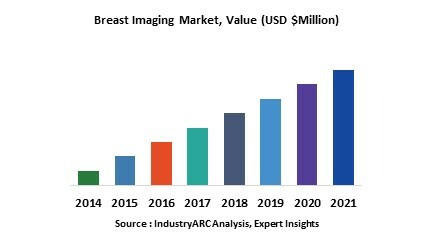 It also highlights the potential growth opportunities in the coming years, while also reviewing the market drivers, restraints, growth indicators, challenges, market dynamics, competitive landscape, and other key aspects with respect to Breast Imaging Market. Geographically North America dominated Breast Imaging Market, owing to the presence of developed healthcare infrastructure and well-organized regulatory framework; North America has remained the leader in the breast imaging market. Asia Pacific is projected to have the fastest growth, due to increasing patient population and higher government spending on breast cancer research studies. 8.9. Aurora Imaging Technology, Inc.